The body of the advanced design does stroke toughly and pliantly.
" Also quality everything is pulled out, sound of upper quality is reproduced. Approach of the next generation was requested as a single item design, the CD/MD compound of the new generation. Note: This product presently has completed production and shipment. which The " Hi-MD AUDIO " is the sound recording format of the next generation who actualizes the improvement and long time sound recording of the sound quality when recording with up-to-date speech compression technology " ATRAC3plus ". " Hi-MD AUDIO " not only the disk for record of 1GB, the to format converting also the former MD disk to the Hi-MD AUDIO in sound recording of Hi-MD AUDIO mode, you can use. Of course, using the disk until recently, the MDLP (the LP2/LP4/MONO) and the like you can record even with former MD mode. * Using the Hi-MD AUDIO disk of the 1GB, you cannot record MD mode. The Hi-MD AUDIO disk is the Hi-MD AUDIO mode sound recording private disk. * It is not possible to exist together the sound recording of Hi-MD AUDIO mode and MD mode to 1 disk. * Only the Hi-MD AUDIO corresponding machine becomes possible concerning the sound recording playback to the MD disk and the 1GB disk which the Hi-MD AUDIO format are done. It corresponds to the linear PCM sound recording which it is not possible with the former MD. Because without compressing the sound source you can record the linear PCM, high grade you can enjoy music playback without impairing the sound quality of the CD. The AUDIO sound recording mode " Hi-SP/Hi-LP " of the Hi-MD, the transaction of operation ability to be superior, in all modes such as MDLP and time fast dubbing is shown loads the " High Speed ATRAC DSP ". In addition everything of digital signal processing such as D/A & A/D converter and ATRAC is done at the highest precision of the 24bit, " 24bit processing " is adopted, preponderant quality of the Hi-MD AUDIO is actualized with sound recording * playback total. If you use the large capacity Hi-MD AUDIO disk of the 1GB, longest approximately 34 hours * long time sound recording of 1 possible (chart 1 reference). Large capacity sound recording of approximately 6 times is actualized in comparison with the former MD. In addition, also it is possible the to Hi-MD AUDIO format to convert the former MD disk with the high density record technology of the Hi-MD AUDIO. Former ratio approximately 2 times * long time sound recording of 2 * longest approximately 10 hours was actualized. The material " PEN " whose periodic damping is quick, " natural fiber (canvas)" and the " aramide fiber " the hybrid it loads the large aperture " NEW A-OMF " diaphragm of the 13cm which formed in the speaker. The toughness which answers the quality of the digital media with suppleness was actualized. Furthermore you adopt the material of the same diaphragm to also the dust cap. By the fact that the material of the pronunciation section is gathered, from natural sound of sound has been reproduced. which Response efficiency to be good adopts the new form edge whose emission sound is little for the woofer diaphragm outer circle of the speaker. The ヒダ of V in order letter condition the vibrating axis from the front to convert to cross direction, it has succeeded in decreasing sharply the unnecessary emission sound from the edge. whose The speaker cabinet extensively, you adopt the MDF material which has established reputation with height of rigidity and good quality of sound. It reproduces the sound to which relative importance is large even in the wood panel material, giving the sense of security to the speaker, is beautiful. * It is low limits which unite volume and the speed impression playback new technology " AERO ACOUSTIC DRIVE "
Adopting new technology " AERO ACOUSTIC DRIVE " to cabinet structure, it actualized limits which have volume and the speed impression of evolving former bus reflex system playback low. Furthermore, the normality it is not cylindrical in the bus reflex duct inside the cabinet and you adopt " the slit duct " of new development. Unnecessary emission noise from the duct is decreased not only, cylindrical bus reflex peculiar phenomenon such as time lag of the vibration and the aerial vibration of the diaphragm was improved. Furthermore the superior type X-N9 model adopts the new structure which separates the cabinet and the slit duct section. Holding down the influence of the mutual vibration, reappearance of a more natural timbre became possible. It loads the wide range amplifier technology " WRAT " which corresponds to also the next generation media of DVD audio and the like. There are no times when it falls to the competition on the mere specifications, they make the playback to the super high pass which exceeds the 100kHz possible. While to face in minute music information, the designer repeating the hearing, it is the amplifier of the prejudice which is built up. 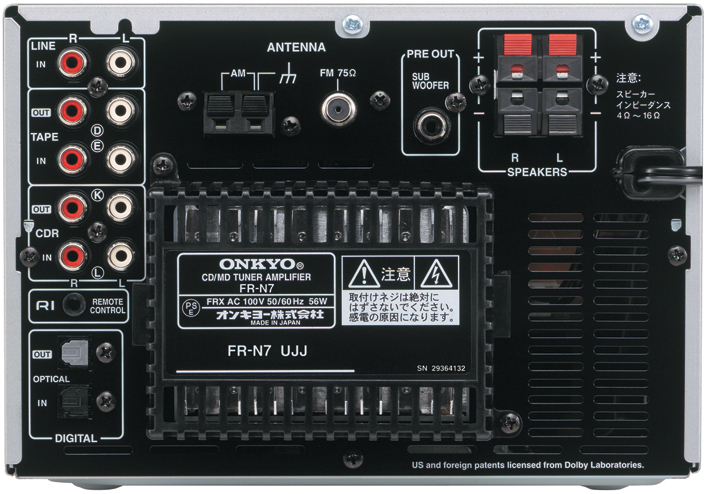 which Onto in the amplifier which is loaded " the FR " N series, the speaker whose impedance is low it actualizes 4 Omega drives whose combination is possible. Because the single item model of the center section (FR-N9) it is, it is possible also to combine with the wide speaker where you do not adhere age and to the manufacturer. Furthermore, it follows the discrete constitution which is adopted with the large-sized single item compound. It does not depend on the IC tip/chip, selects part one one and by the fact that it designs, it actualizes creative sound expression. High drive ability and specification where it is equal to full size, are condensed to the compact body. As for " the FR " N series, the private RI Dock which can operate the iPod series with remote control of the knitting machine; It corresponds to the DS-A1. If the iPod is set to the DS-A1 and the cable of attachment is connected to " the FR " N series, basic remote control operation is possible the オンキヨー cRi system (the = Remote Interactive) with. The iPod which does not have remote control, you can enjoy with home with real sound " of the FR " N series. - Dubbing mode " FADE "